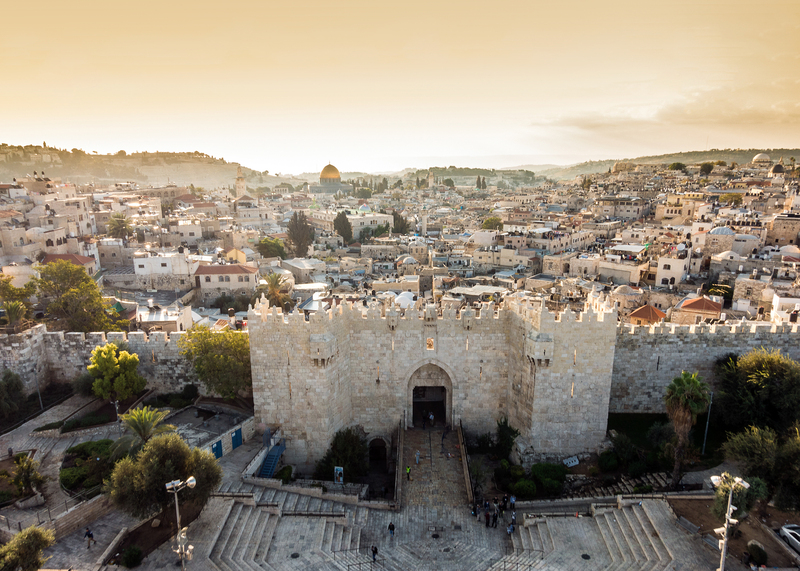 Combining two of the Middle East’s most fascinating destinations makes perfect sense and with A&K a private guide accompanies you in both countries bringing to life thousands of years of history. You’ll walk in the steps of biblical giants and modern-day adventurers seeing some of the world’s most iconic and ancient sites and understanding something of contemporary life and cultural relations in this extraordinary part of the world. 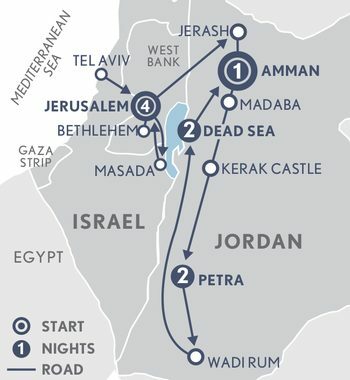 Day 5: Jerusalem – Border – Jerash – Amman, Jordan. This morning you are transferred for the border crossing into Jordan with VIP immigration services. Journey to the ancient city of Jerash, acknowledged to be one of the best-preserved Roman provincial towns in the world, hidden for centuries in the sand before being excavated and restored some 70 years ago. Explore the iconic temple of Artemis at the highest point of the city, the long colonnaded street, with its original stone paving, and the monumental Hadrian’s Arch built to celebrate a visit by the emperor himself - all which were hidden for centuries in the sand before being excavated and restored some 70 years ago. Continue to Amman and your luxury hotel. Day 6: Amman – Madaba - Kerak - Petra. Explore on foot the many wonders of the ‘Rose-Red City’, one of the most famous UNESCO World Heritage Sites in the world, established as the capital of the ancient Nabataeans as an important stop on the caravan route between Asia, Arabia and Europe. Discover tombs, temples and exquisite monuments hewn from solid brick-red sandstone mountain rock. Whilst the entirety of the Petra site is extraordinary, the most well-known sites include the Treasury, accessed through the narrow ‘siq’ – a naturally occurring geological rift between mountains, the Roman Theatre, the Corinthian and Palace Tombs and the Roman Road. Later climb the 1,200 steps to one of the ancient city’s most awe-inspiring monuments, the Monastery. With a massive facade almost fifty metres square, carved from a chunk of mountain, the summit offers spectacular views. Day 8: Petra – Dead Sea. Travel south to Wadi Rum, setting for the epic 1962 film ‘Lawrence of Arabia’ and more recently ‘The Martian’. Discover impressive red desert landscapes, huge rock formations, narrow canyons and Bedouin settlements on a 4WD excursion. Continue your journey across an arid landscape with strangely shaped mountains to the lowest point on the earth’s surface, The Dead Sea. At more than 400 metres below sea level, it is known for its highly salty waters. Spend time in arguably the most luxurious resort on the Dead Sea. Day 10: Dead Sea – Amman. Your A&K journey will conclude, with your private transfer to Amman and the airport for your onward journey.